This shop has been compensated by Collective Bias, Inc. and its advertiser. All opinions are mine alone. #IKnowAFighter #CollectiveBias. In the spirit of NF Awareness month and the fight to #EndNF, compensation from this post will be donated to #TeamMaddox. Here at The Rockin’ Boys Club, we think there are many ways our kids can make a difference in our communities, states, countries and even the WORLD! We want to recognize some of these amazing boys who are doing just that. In our “Boys Who Rock the World” series, we feature boys who devote their time to service, or who inspire people by leaving their mark on their communities. This is 6 year old Maddox. He was diagnosed with Neurofibromatosis (NF) at the age of 4. You may not have heard of NF, but it’s more common than you might think. NF affects one in 3,000 people around the world, and there is no effective treatment or cure. Maddox is in my son’s kindergarten class, and they became fast friends. Maddox is a fighter. He’s been through two back-to-back brain surgeries, one to relieve pressure from hydrocephalus and one to remove 6 inches of a plexiform neurofibroma in his skull. Due to balance issues, he’s had a broken arm, broken nose, and broken collarbone, all within the span of a few months. Maddox has super hero strength. He got through all of his healing and injuries without much complaining at all. Maddox inspires people every day! Despite his set backs, he is always putting others first, and thinking of ways he can help make people happy. 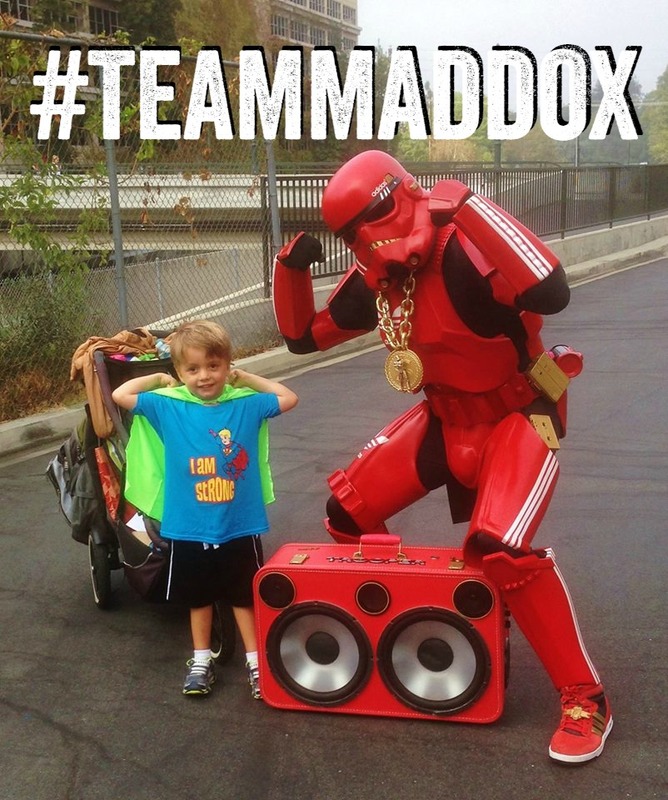 A first-time LA Marathon runner caught wind of his story, and Maddox touched his heart so much that he decided to run the marathon for #TeamMaddox before he ever even met him. 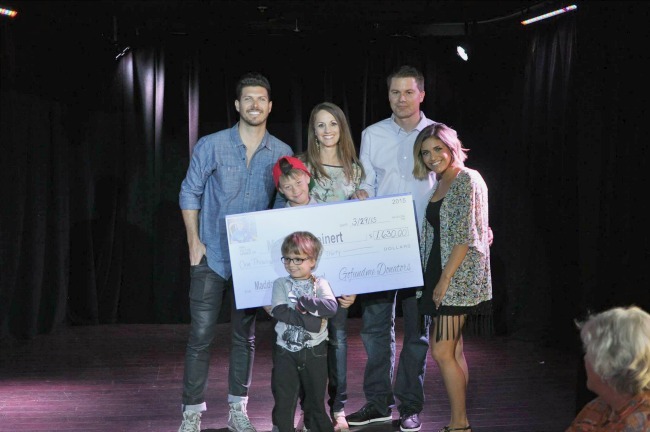 The money he raised on behalf of Maddox went to benefit the Children’s Tumor Foundation. At the NF Fashion Show, Maddox rocked the runway with other NF heroes. His happy demeanor and positive attitude make everyone around him smile. Maddox doesn’t even quite know the impact he has on people. 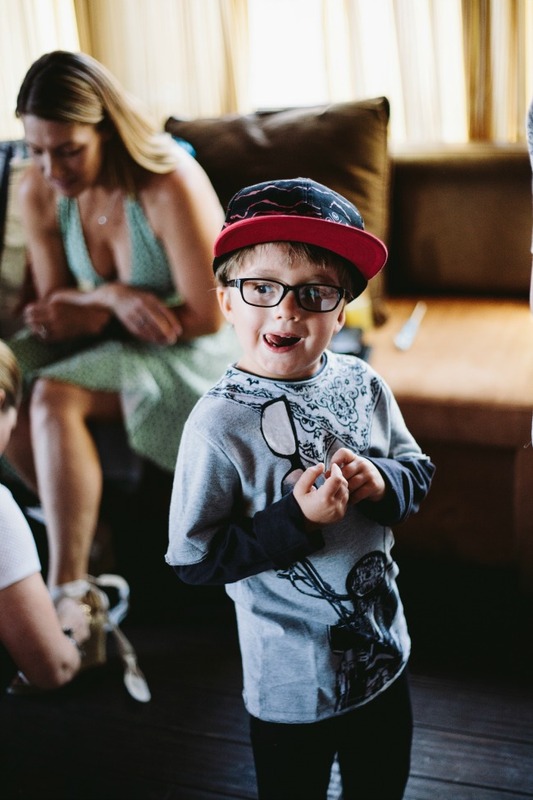 We think Maddox rocks, and want to help to not only get his story out there, but also to spread the word about Neurofibromatosis and The Children’s Tumor Foundation, who is working to find a cure. 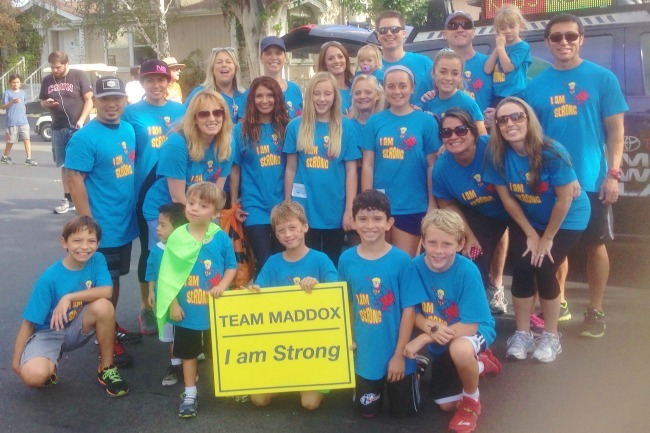 Maddox’s mom believes that early intervention is important in the fight to end NF. She strongly feels that the second surgery Maddox went through could have been avoided with early intervention and working with NF specialists. As a baby, Maddox’s mom noticed that he had a lump at the base of his skull. It was misdiagnosed as a lymphangioma, and nothing else was done about it. As he got older, his parents noticed things were off. He was very small with a larger head, his balance wasn’t very good, he had speech issues, and just seemed developmentally behind. All of the sudden things got really bad really fast. He fell and broke his arm, falling off of a playground step onto a soft ground. While recovering, he was very tired and lethargic, and didn’t want to do normal boy things. He just laid on the couch and watched TV and slept. His parents knew something was just really off and took him in to see a specialist. An MRI revealed that the bump on back of his head was bigger than they expected, and they discovered hydrocephalus, which is a condition in which too much fluid surrounds the brain. Surgery happened right away to relieve the pressure of the hydrocephalus. They also found a separate issue: a lesion on his brain stem that cannot be removed or even biopsied because of the location. 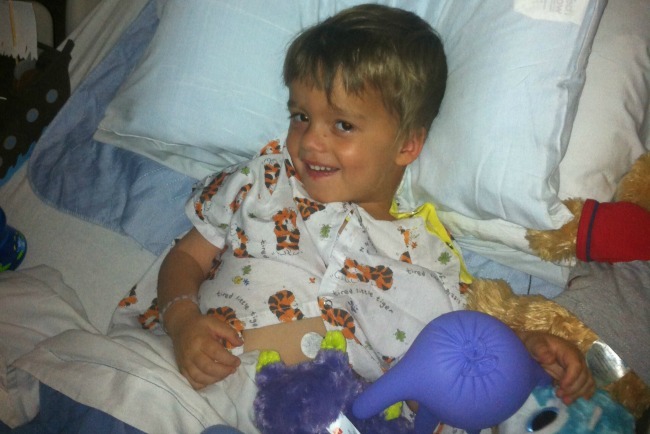 Another surgery was done to debulk the tumor, though doctors still didn’t know what exactly was going on with Maddox. 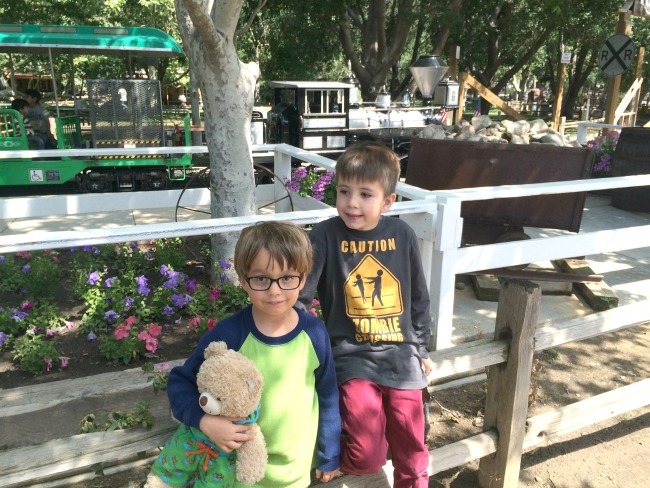 They suspected NF1, and sent some blood work to be tested. Seven weeks after his surgeries, his blood work came back. Finally, there had a diagnosis. 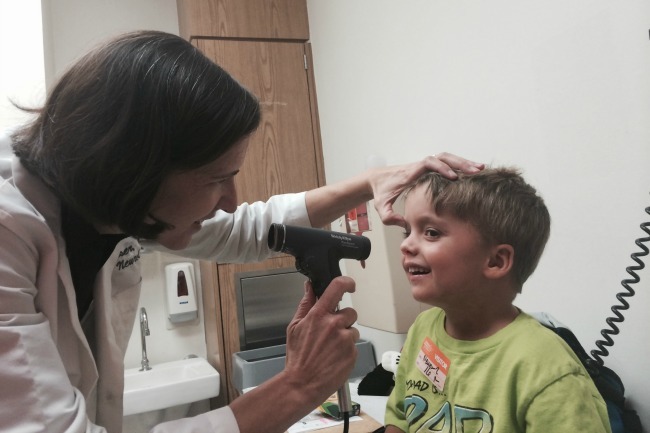 Even though Maddox’s doctor didn’t think he had NF, the blood work came back positive. After months of questions and not a lot of answers, Maddox and his family were sent to an NF specialist. Maddox’s mom wants to stress the importance of going to an NF specialist. They are heavily involved in the latest research and trials, they keep in contact with other NF specialists around the world, and work closely with The Children’s Tumor Foundation. When Maddox was first diagnosed with NF, his family felt helpless and hopeless, and not knowing where to begin. His mom started to do a lot of research online (as most of us worried moms do) and learned about the Children’s Tumor Foundation, and that they were doing a walk in Los Angeles. She decided to participate in the walk, rallying friends, family and even strangers to help raise money and in a matter of weeks raised $4000. Over the next year and a half she continued to participate in fundraisers and help raise awareness. Because of all of her fundraising efforts, she was invited to attend the NF forum in Arizona a few weeks ago. The NF forum was just one of many CTF events that happen all over the country. Check out the Children’s Tumor Foundation Calendar of Events and see if there’s one near you. You can also find more info on events and other ways to help by following CTF on Twitter, Facebook, and Instagram. Maddox fights NF by being postive and strong! His mom fights NF by volunteering, raising money and telling everyone who will listen. Rockin’ Boys Club fights NF by helping spread the word! Do you know a fighter? 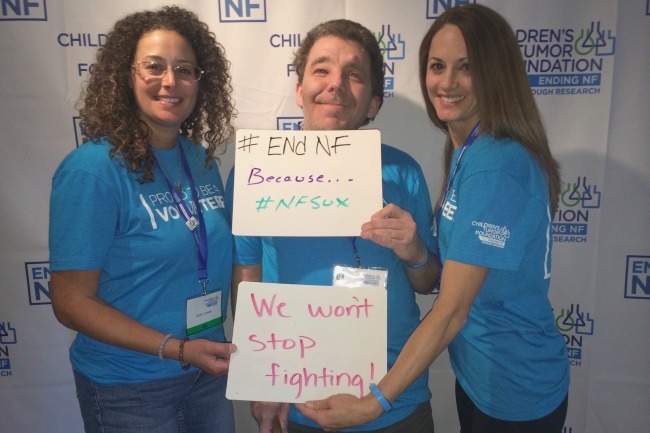 Will you join the fight to end NF? If you have, or know a Rockin’ boy who is amazing, we’d love to feature them. Please email us at rockinboysclub@gmail.com and we will coordinate a feature post.